A few weeks back, I was contacted by a marketing rep for a relatively new device called the Sonic Foamer. 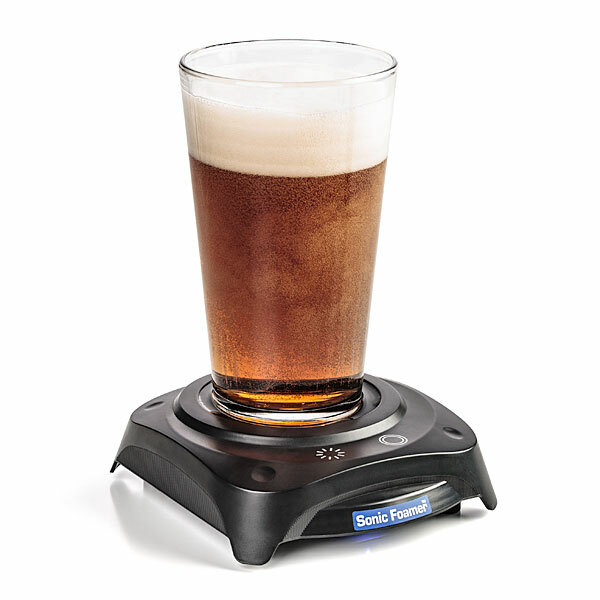 If you’re tuned into the beer world, you may have seen this gadget already. In a nutshell, it’s a device for embiggening the head on your brew. But just how cromulent is the Sonic Foamer? After receiving a sample in the mail, I was off to the Aleheads Testing Lab! The marketing rep requested an honest review of the product, nothing more, nothing less. So here’s the skinny: The gadget works as advertised…but it has some flaws. First, a description. The Sonic Foamer is a small, black plastic puck about 6 inches square and about an inch and a half tall. It has a shallow, circular well in the center for placement of a beer glass, an on/off toggle switch underneath, and a single, LED-backlit button on the front. You switch the device on, dump two teaspoons of water in the well, place your glass in the little puddle of water, and then push the button. The gadget then sends a pulse of sonic waves (with a delightful little “ping”) through the liquid which agitates it enough to refresh the head on your beer. In concept and execution, the Sonic Foamer is pretty simple. You’re halfway through your beer and get called away because your kid can’t find their other shoe, or your washing machine is leaking, or your dog is tearing up a cardboard box in the hallway (all things that happened to me last night). When you return to the kitchen, your beer has gone the way of Louis XVI and is now headless. So you grab the Sonic Foamer, splash in some water, plop down your beer, hit the button and you’re back in business. Why does this matter? All Aleheads know that a proper head is a necessity for the true enjoyment of a beer. Beyond looking nice*, a full, fluffy head is the delivery mechanism for a beer’s aroma. That pillowy cloud of bubbles popping under your nose are releasing all the hoppy/malty goodness up your nostrils and into your olfactory bulb. Without a proper head, your beer’s “nose” is muted. *Appearance is no small thing, of course. We eat AND drink with our eyes first. I experimented with a few different beers. Wicked Weed’s Pernicious IPA (an absolutely gorgeous, dankly drinkable brew) benefited greatly from the Sonic Foamer. Revitalizing the head on the Pernicious brought back the resinous goodness in the nose after the glass had been sitting still for a few minutes. Less successful was Prairie’s Bomb (an awesome, oily Imperial Stout). The big, thick brew didn’t have much of a head to begin with and the Sonic Foamer can’t work miracles. I also tried the device with a glass of Scotch, neat. The Scotch just laughed. As I stated above there are some drawbacks. The device is a little “cheap” looking. It’s just a simple, black plastic puck. Some higher-end flourishes (perhaps a touch of stainless steel and a more solid base) would help. The on-off switch under the device is poorly located. Ideally, the device wouldn’t even have an on-off switch…just the single button. It also takes 6 AA batteries which seems like 4 too many. No small gadget should require an entire pack of Duracells. Perhaps a rechargeable battery would help in future builds? Finally, the need to dump in two teaspoons of water is frustrating. Obviously it’s necessary from a physics standpoint…the water serves as the medium that allows the sonic vibrations to consistently penetrate the beer glass. But in practice, it means you’re stuck with a wet beer glass that sticks to coasters or leaves water marks on your table. If there was a material that would allow the device to work properly without getting your glass wet, the Sonic Foamer would be markedly improved. Still, all drawbacks aside, the Sonic Foamer is a pretty cheap, fun little gadget that does exactly what it claims to do. If you’re an IPA drinker who loves a big, hoppy nose on your beer, the Sonic Foamer will help maintain that nose throughout a session. It’s gimmicky to be sure, but it’s a gimmick that makes your beer just a little better. And that’s all that matters to an Alehead. Posted in Beer Marketing.Tagged Sonic Foamer. Maybe they can get a heating element into it and try to market this as a yeast starter? Yeasties love the shakes. 6 batteries does seem like overkill, but what the hell do I know? I rarely shake things with water.